Criticwatch was off for the month of August and now that the summer of 2010 can officially be declared dead with the coming of Labor Day, we can look back upon it and see why we might have had to just get away from it for a little while. On one hand we had, almost inarguably, the worst summer season for movies ever and the movie studios still allowing quote whores and sluts to flourish even over the name of good films that could crib far more reputable praise for. On the other we had the cancellation of At the Movies and then Armond White shooting down any great film just because it lacked the auteur vision of Neveldine & Taylor. Just where was a moviegoer going to turn for an informed opinion? Out of 44 films released this Summer on over 1000 screens or more, only 16 of them garnered enough favorable reviews to get the proverbial "fresh tomato." That's a 60% or higher percentage amongst reviews at Rotten Tomatoes. That's 28 at 59% or lower, eight of which could not even average a 1-in-5 recommendation. Three of THOSE films even managed to gross $95 million or more at the box office, so there truly is no accounting for taste across the board. Market the film right to a core and that audience will go. You might not even need reviews at all, but the studios are aware that not screening a film ahead of time comes with its own stigma - even if they don't always guess right. 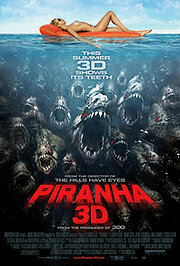 On that list of 44, Piranha 3-D is the 7th best reviewed film of the summer. Seems the only publicity it got was from either James Cameron bad-mouthing it or by the clips of Kelly Brook on Mr. Skin. Just where was the support from the Weinsteins? In the three weeks of its release not once did a single ad appear in the weekend Arts & Leisure section of the New York Times. Which means, naturally, no use for critic quotes that they didn't have - but could have had - if they had shown it to critics. Knowing the game though their marketing geniuses would have gone with the usual suspects like Pete Hammond and Peter Travers, guys the studios make sure to give first looks at their product cause they are almost guaranteed a printable quote before they have even written a word. Both are bad writers with nary a thought they couldn't feed directly to a studio that is happy to listen. Props, as always, for trying though. We know the average quote whore is no more a writer than they are a speaker, but it is time the marketers stopped treating the word of the two Petes as if they were Siskel & Ebert. Between May and August of 2010, three of the biggest quote whores were Shawn "I Love Black Film" Edwards with 7 quotes, Jeff "The Disembodied Voice" Craig with 8 and Mark S. "For Shithead" Allen with 9. Counter that 17 quotes for Hammond and a whopping 27 for Travers. Even if you weed out the under-1000 screen quotes and knock down their tallies to 13 & 14 respectively, consider what they were recommending when only 16 films were above par for the majority at Rotten Tomatoes. Hell, I only recommended 11 of the 44 above. (Of the seven films I actually missed, only two - Nanny McPhee Returns & Ramona and Beezus - got a "fresh" rating.) It was a bad, BAD summer. Though not if you followed the quotes. Now, don't mistake me, there are some good, even great, movies on that list. There are also some of the worst reviewed films of the year and even some dumber statements. Just what world are we living in where a film about a disgraced sailor who talks to his dead kid brother considered "a great summer movie?" Hey honey, forget the kids seeing Toy Story 3. Let's take them to Charlie St. Cloud. Granted, Toy Story 3 was still two weeks away from release, but how could Joel Amos call Marmaduke "the perfect family summer comedy?" I don't care what season it is, but "perfect" and "comedy" are two words that do not belong in the same sentence as the fourth worst-reviewed film of the summer. Though the answer should be self-evident when Amos is the moron who called The Back-Up Plan "The first great romantic comedy of 2010" and further cemented his seasonal credibility by calling The Sorcerer's Apprentice "The perfect summer movie." The Last Exorcism was one of those 11 films I recommended this summer (along with various limited releases), but "the scariest movie of the summer?" I am not questioning Sandy Kenyon's assertion that it was indeed the scariest film of the past four months. My question would be to exactly what was he measuring it up against? How many horror films can you think of that have been released since May in theaters? Splice, Survival of the Dead, [Rec] 2 and Piranha 3-D was about it. Not a whole lot of competition out there. Perhaps Mr. Kenyon figured there were more with titles like Machete, The Killer Inside Me and Beetle Queen Conquers Tokyo out there, but to lead with a statement like "scariest movie of the summer" its competition better be more than a single film per month. Still, it's better than going nearly the entire summer to say you have finally found "the action-packed, thrill ride of the summer" and it's friggin' Takers! Did James Thomas not see Inception? I would think that certainly qualifies those adjectives. Ah, but Inception was not released through Screen Gems whom Mr. Thomas made his name pimping for in 2008 calling First Sunday "The first laugh-out-loud comedy of the new year" and Untraceable "Silence of the Lambs for the internet age." Thomas was also seen on the ads for Screen Gems' 2010 remake of Death at a Funeral which he humbly called "The most hilarious movie of the year!" and added a little pun ("Drop dead funny") for good measure. Four of the seven quotes Thomas has given were for Sony's division of Screen Gems. The other three were for the lowly-rated Over Her Dead Body, 10,000 B.C. and Sony Tri-Star's ultra-delayed Al Pacino thriller, 88 Minutes. And how can we not revisit Pete Hammond's assertion that "It's impossible to have a better time at the movies this summer" than at Despicable Me when he had already pimped for seven other films this season in ads? And then over the next seven weeks until the end of August, Hammond blew his wad over nine more summer films AFTER the impossibly topped Despicable Me. In fact, if you look at Hammond's Rotten Tomatoes page you will find that of some 36 films that he reviewed this summer which opened somewhere, he only went negative on 4 of them - Multiple Sarcasms, Holy Rollers, Standing Ovation and Valhalla Rising. Mind you, not one from a major studio. And, at least two of his reviews (Toy Story 3 & Inception) garnered higher ratings than Despicable Me. Studios need to come to their senses when choosing which critics to get into bed with. Yes, guys like Hammond and Travers are practically guaranteed to get you a quote but they are empty words from empty human beings. It is like getting George W. Bush to endorse your military strategy. And yet with all the articles being written about the end of At the Movies, all of them retracing its history, all of them citing Ben Lyons as an absolute disgrace and even some calling him the final nail in its coffin, WB's decides to utilize him on the ads for Going the Distance just two weeks later. There are too many reputable critics available to go with if you just do a little research. It costs you no more than you are spending now and it might even save you a few bucks. Even in a summer as bad as 2010's there is always a choice.